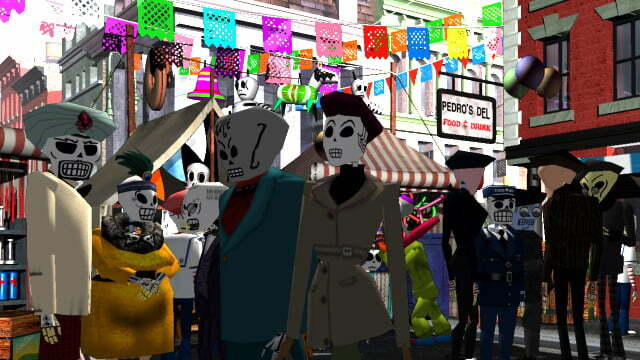 Grim Fandango Remastered is one of the most satisfying re-releases of a title that will hopefully introduce a new generation to a truly unique and inspired game. Read our full review here to see why this release is so special! From the storied annals of LucasArts’ fantastic point-and-click adventure games like Sam and Max, Maniac Mansion, and the Monkey Island series, Grim Fandango stood above them all and was (and largely still is) my favorite video game of all time. It’s a beautiful, comprehensive story that even spanned multiple discs, a concept that now means nothing but was kind of significant in the ‘90s. Schafer sets you in a noir adventure that’s deeply interwoven with a Day of the Dead motif (long before Tim Burton had gotten anywhere close to the idea with The Corpse Bride) to create something very different and fascinating. You set out as Manny Calavera, a grim reaper in the Afterlife caught up in the bureaucracy of taking souls, as he hopes to eventually get his freedom and happiness. The game is difficult and challenging accordingly, like most of these adventure games of yesteryear were, but it makes solving the intelligent, grueling puzzles all the more satisfying (I’m looking at you, road sign puzzle and petrified forest maze!). This game will really push your brain to its limits. Everything old is new again! Manny’s skeleton looks as fresh as a baby. One of the most fundamental changes to the upgrade, and one that isn’t just in the aesthetics, falls into the new, revamped analog controls that function much more like a conventional point-click-adventure game. It’s even set as the standard, with the original tank-style control scheme available as an option. Most impressively here is that Schafer accomplished this by buying the coding of a devout fan and modder to create this analog style, resulting in a perfect combination of the adoration and respect amongst this game’s community. I played the PlayStation 3 version of the game, but surely the Vita release would be the most desirable. People have been waiting for a re-release of this classic title forever, and to not only get one, but to also have the ability to take Fandango on the go, is kind of an incredible gift. While the PlayStation 3 is clearly more graphically capable than the Vita, the Vita’s version of the game doesn’t seem to be suffering from any negligible differences from the PS3 port. The thing that most people are going to go on about and take away from this game is the overhauled graphics that took a pleasant looking game that was symptomatic of its time and really made it look pretty damn shiny, and pretty. Also brought to the table are pre-rendered backgrounds that have had the resolution notched up, and real-time 3D character model textures that have been completely redone (a feat that’s even more impressive considering some of the original files of Fandango were lost, with Schafer and co. even tracking down original employees to see if they had any lingering files). On top of that, there are nice little visual flairs in the lighting and surfaces that would have been impossible in 1998, but are part of the consumer’s expectation now. And if you don’t believe how decent of an upgrade Double Fine has done here, simply hit a button and the game will revert back to its original presentation style and you can see for yourself. While this “past and present” feature has become pretty routine in re-mastered games like this, it’s still a nice addition. 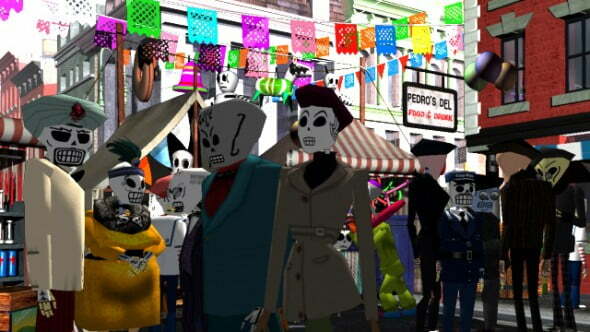 The Day of the Dead has never been so alive and vibrant! In terms of presentation, you’re given the option of the original 4:3 aspect ratio, but widescreen is also now thankfully included, as is the ability to stretch out the original image. I don’t see why you’d be interested in that creative brand of masochism though. There’s also a nice, completely unnecessary feature in the form of developer commentary, where approaching certain objects or locations will cue a “director’s icon” in the corner, and pushing L1 will activate it. Here you’ll listen to Tim Schafer and his team of developers wax nostalgic on the game. It’s kind of a beautiful touch, considering the legacy behind this title. Listening to the king of this game basically do a playthrough and responding just like we do when we play it is all sorts of awesome. The digital MIDI score of the original release has also been replaced by a full real orchestration, with the Melbourne Symphony taking the stage. They’re the same people that did the re-vamped movie on the re-mastered version of Broken Age, and this is just as awesome, making what was already an enigmatic score even more incredible. 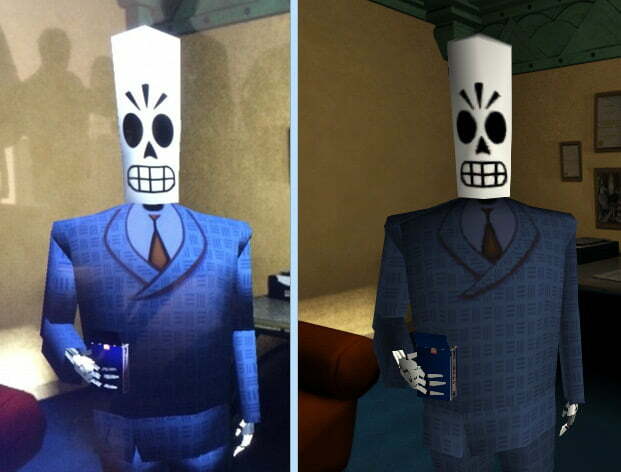 Grim Fandango Remastered is an exceptional update to an exceptional game that is one of the finest pieces of storytelling ever to grace the medium. The out of date control schemes and graphics have been overhauled with impressive modern takes, and fancy touches like real symphony orchestrations and commentary have been gleefully added. There’s absolutely nothing wrong with this game, bearing the steep difficulty at times, and it’s the perfect time to check it out if you haven’t before. Daniel Kurland is a freelance writer and comedian, who recently completed work on his noir anthology graphic novel, Sylvia Plath’s The Bell Noir: A Rag of Bizarre Noir and Hard Boiled Tales and is the creator of the surrealist podcast, “Bic Zukko’s Forever Almanac”. His sketch troupe, Business Computer also performs a monthly show in Manhattan.